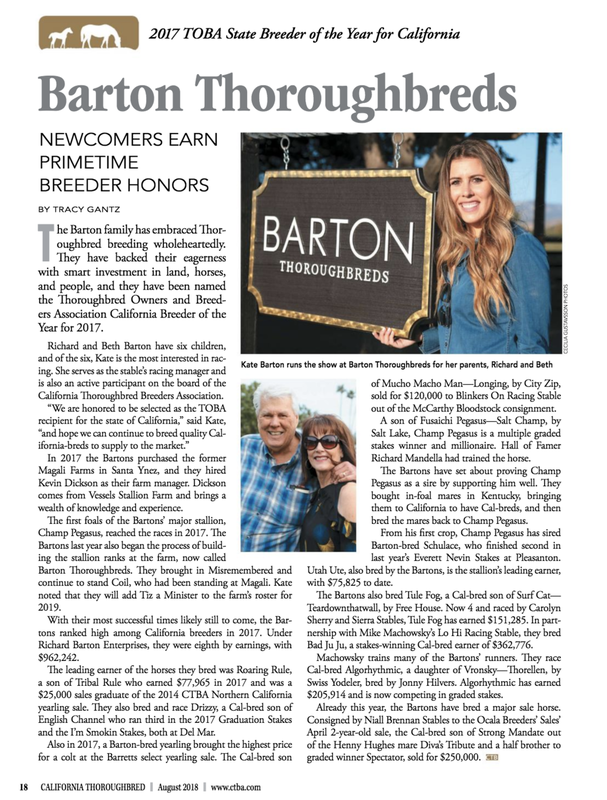 LEXINGTON, Ky. (Aug. 22, 2018) – The Thoroughbred Owners and Breeders Association named Richard Barton the California Breeder of the Year . TOBA also announced that eFive Racing, Godolphin, Juddmonte Farm, Rockingham Ranch and the partnership of Winchell Thoroughbreds and Three Chimneys Farm have been selected as finalists for the TOBA National Owner of the Year. The TOBA National Owner of the Year will be announced live at the TOBA National Awards Dinner, which will be held on Saturday, September 8 at the Woodford Reserve Club at Kroger Field in Lexington, Ky.
TOBA will also honor breeders from 23 states and Canada. The National Breeder of the Year and the National Small Breeder of the Year will also be disclosed at the TOBA National Awards Dinner. Other TOBA national award winners include Win Approval, dam of World Approval, who has been named as the National Broodmare of the Year and Mended, who will be honored as Claiming Crown Horse of the Year, presented by the National HBPA. The Rood & Riddle Sport Horse of the Year will go to Arglye, owned by Skyeler Voss and owner/breeder George Strawbridge will receive the Robert N. Clay Award, which recognizes a member of the Thoroughbred community who has made an outstanding contribution to preserving land for equine use. Tickets to the TOBA National Awards Dinner can be purchased at www.toba.org or by calling Meredith Downey at (859) 276-6793. South Carolina: Franklin Smith Sr.
Policy repelled a stiff challenge by Feeling Strong deep in the Del Mar stretch to break his maiden by nearly a length in the 5 1/2-furlong affair for 2-year-olds. The chestnut colt is Strong Mandate's second winner from his first crop of runners. The Three Chimneys stallion has also had some excellent results in the sales ring. His 2-year-olds have averaged $156,050 this year, fourth among all freshman sires. Policy broke well, but was eased back by red-hot rider Drayden Van Dyke, and was last of eight at the mid-point on the backstretch. Around the turn, he steadily advanced between horses, eventually taking command with less than a furlong to run. The winner dug in gamely to hold off the runner-up, stopping the timer in 1:05.95 on a fast main track. Policy was a $250,000 purchase by his owners Eclipse Thoroughbred Partners and ERJ Racing at the OBS Spring Sale of 2-year-olds in Training in April. Bred by Richard Barton Enterprises, Policy is a half-brother to Sorrento S. (G2) winner Spectator. Cutting through dense fog over a sloppy (sealed) track at Pimlico Race Course, 3-year-old Ax Man led at every point of call to snag the May 19 $100,000 LARC Sir Barton Stakes and take home his third win of the season. In a portent of things to come, Hall of Fame trainer Bob Baffert and fellow Hall of Famer Mike Smith found themselves in the winner's circle only an hour before the Preakness Stakes (G1) as Patti and Hal J. Earnhardt III's homebred Ax Man proved uncatchable in the 1 1/16-mile test over the Baltimore oval. With the field halved by early scratches due to inclement weather, Ax Man broke second from post 4 in a field of six 3-year-olds, charging to the front to set the pace. Title Readymanaged to drive up to his flank but couldn't muster the speed to edge ahead as Ax Man hit the six-furlong mark in 1:11.30. Turning for home, the bay colt opened up by a length with a strong kick, and he crossed the finish line in a final time of 1:42.53, 6 3/4 lengths ahead of Title Ready. "Oh man, he just skipped over it. End of story," Smith said. "He broke sharp and skipped over it, no problem. He's exciting." Prince Lucky finished third, followed by Pony Up, Dream Baby Dream, and Navy Commander. Sent off as the 1-2 favorite, the winner paid $3.20, $2.40, and $2.20. A son of multiple graded stakes winner Misremembered, Ax Man broke his maiden on debut with an easy, 9 1/2-length victory over six furlongs at Santa Anita Park. After running fourth in his next effort and first try in graded company in the San Vicente Stakes (G2), Ax Man rebounded to win a one-mile optional-claiming allowance race by another handy 8 1/2 lengths before heading to Maryland. "He was a little anxious when he got up here. He was fine until he got to the paddock, but once he got away from the crowd, he settled down," Baffert said. "It's just a lot of raw talent. … I chose this race just to keep him two turns, ship him, and see how he handles it. We've still got to work on some things. He's still a little young." Bred in Kentucky by Hal J. Earnhardt, Ax Man is out of the Flying Chevron mare Shameful, who produced 2007 champion 2-year-old filly and 2008 champion female sprinter Indian Blessing and grade 3 winner Roman Threat, as well as two other stakes winners. Ax Man has a record of 3-0-0 in four starts with earnings of $138,000. OCALA, Fla. (Apr. 24, 2018) – A California-bred son of Strong Mandate sold for $250,000 at the OBS April Sale of Two-Year-Olds on Tuesday. The colt is from the first crop of Strong Mandate, out of the Henny Hughes mare Diva’s Tribute, was bred by Richard Barton Enterprises, consigned by Niall Brennan Stables, agent, and purchased by Eclipse Thoroughbred Partners & ERJ Racing. He is a half-brother of Spectator, winner of the Grade II Sorrento Stakes at Del Mar and third in the Grade I Del Mar Debutante. The colt worked one-eighth of a mile in :10.1.